For the trip I splurged on a new travel set of Koi watercolors. It contains 24 half-pans, so the whole set measures only 4 X 6". I bought a little booklet of Fluid 140 lb. Cold Press paper to go with it so the whole set-up slips intp a purse or jacket pocket and I'm good to go! 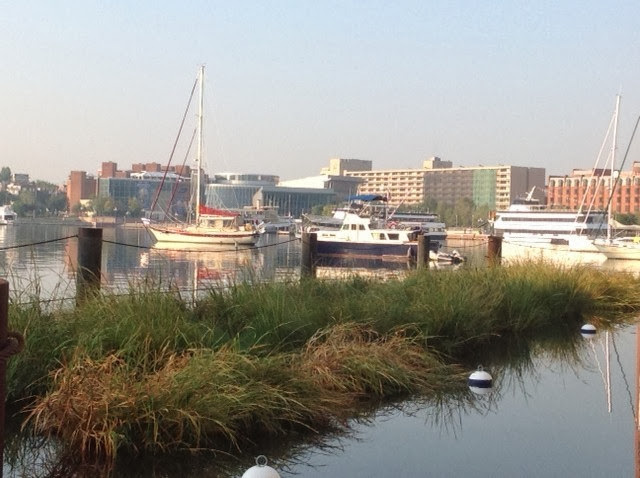 The historic boats docked in the harbor are great fun to explore. 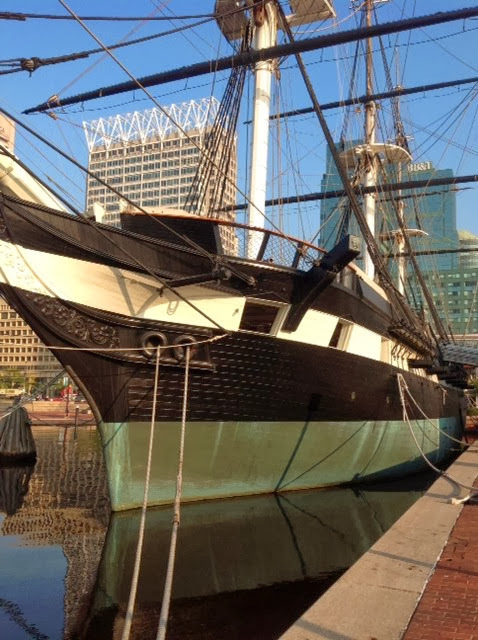 My favorite, the USS Constellation, was the last sail-only service ship designed and built by the US Navy. Isn't it just gorgeous? I wish I had remembered to take a few photos while I was actually on the ship! I sketched a few smaller sailboats yeserday and it was even more of a challenge than I anticipated. 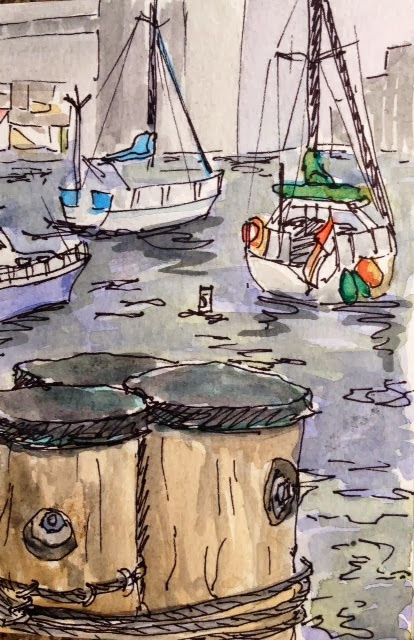 The constant motion of the boats meant I had to draw quickly...no time for too many details. The sketching part is coming easier these days but it's still a bit of work for me. When it's time to add color, though, I am one happy girl. That's when I really let go and get lost in the process. I love the subtle nuances of color...the way different colors of light bouce around and affect the appearance of everything around them. Painting a scene is such a personal way to enjoy the beauty around you. Today I'm meeting up with a dear friend that I hadn't seen in over 20 years. She and her hubby have traveled here from Connecticut for the weekend and I am beside myself with excitement about getting to see them! Can't wait to tell you about it in my next post! Hello Janice, these are all so lovely! You've taken quiet and special moments to sketch and paint all these beautiful marine scenes, what a peaceful and serene break you've had! What a special trip! 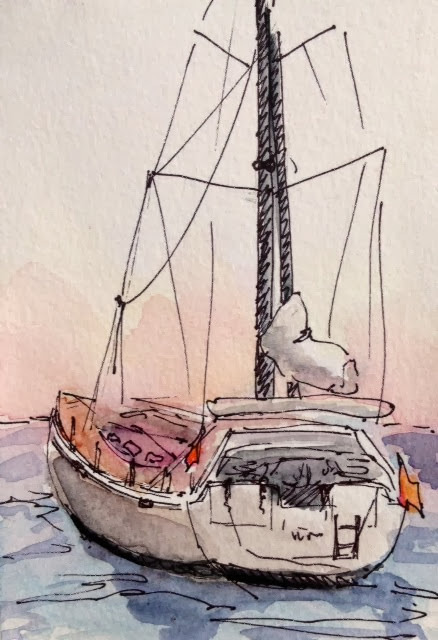 I love your paintings of the boats and the ocean. The ocean is my very favorite place!!! Have a wonderful trip!! 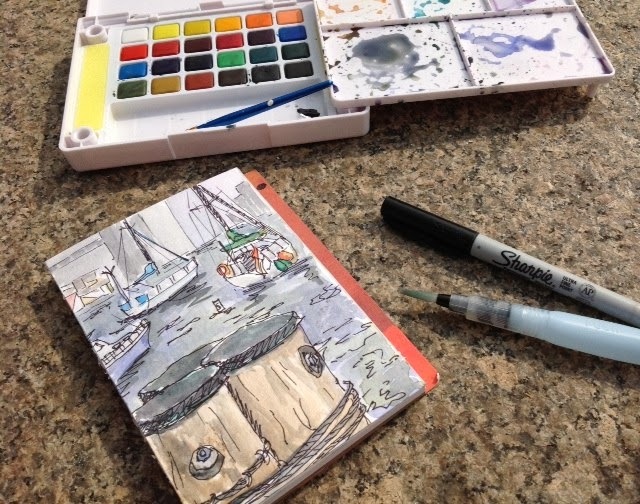 Your sketches capture the charm of the harbor. Coincidentally I am in maryland this weekend. I'm visiting my family along with my sister who lives in Connecticut. Our trip has taken us to Smith Island where my family is from. Enjoy your trip! your paintings are gorgeous, I love the way you described them too! 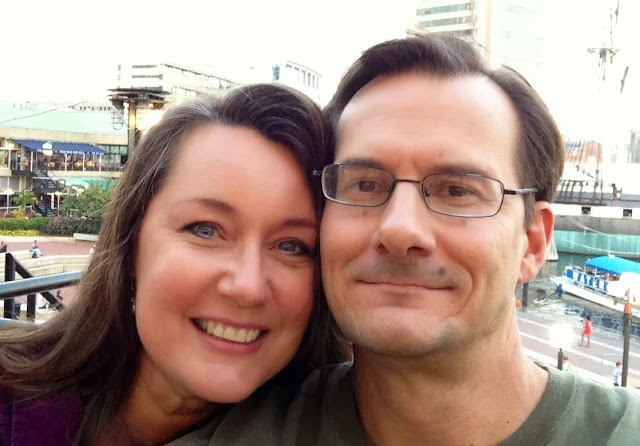 You and your hubby are a lovely couple! So beautiful marine scenes and your watercolors are stunning!!! that really does seem like the perfect travel kit, well done for keeping it so very simple and small! so glad you had a good time away. Your sketches/paintings are wonderful. You did an amazing job capturing the pinks in the sky and the peacefulness of the harbor. It seems like you may have found a little time to enjoy the sights with your husband, which always makes business trips better. Blessings! Such a super beautiful post, wonderful and warm-hearted..lovely memories..enjoy your time with your friend! Gorgeous art..very inspiring..peaceful...fantastic work..love your paints too! Love that Janice & Tim picture! And sketches are fab! Wonderful sketches Janice. Thank you for sharing these. This summer we too had made a trip to Baltimore and I've many photos from there. I need to go through them and try to sketch some. Thank you for the inspiration. Wow! I love your paintings, they are full of beauty and charm. Amazing! You and your husband are adorable. I hope you have a great time with your friend.